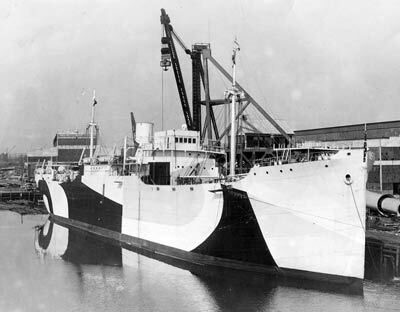 On 19 June 1918 a new ship was launched from the Federal Shipbuilding Company's shipyard at Kearny, New Jersey, USA. The shipyard was located where the Hackensack River enters Newark Bay. 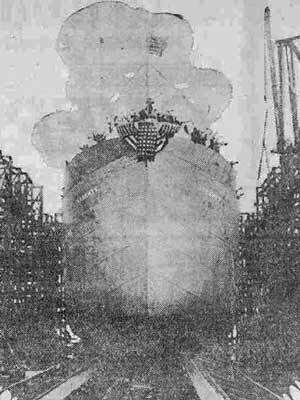 In fact, this was the first ever ship built at this shipyard and was actually started as the SS Wichita. It seems that at some time the ship was taken over by the US Navy from the owner, the US Shipping Board. The ship was a Design 1037 ship, one of many built for the Board. The new ship was 411 feet long (125.3 metres), 55 feet wide (16.8 m) and had a draft of 26.5 feet (8.1 m). It displaced 4,809 tons and was powered by a single 2,500 steam engine. She had a speed of 11 knots and was crewed by 70 men. Armament was one six inch gun and one three inch gun. The ship was completed in October 1918 and on 7 October 1918 it was commissioned into the US Navy as USS Liberty (ID 3461). Lieutenant Commander Charles Longbottom was the first skipper. 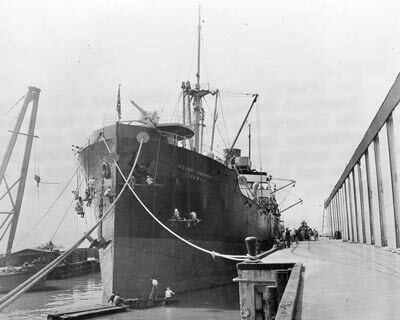 The new vessel was assigned to the Naval Overseas Transportation Service and on 24 October 1918 she departed the New York Navy Yard for France. It seems that its primary role at this time was as an animal transport. On 8 November 1918 she arrived in Brest, France, with a cargo of horses. Two more return trips to French ports were done in the following six months. As well as carrying animals (presumably horses), she carried general cargo. On 30 April 1919 the Liberty returned to Newport News, Virginia, and discharged 436 tons of US Army cargo and 2,072 tons of steel rails. This was her final cruise (well, at least for that time) and on 7 May 1919 USS Liberty was decommissioned from the US Navy. The ship was then returned to the United States Shipping Board. I have no information at this time what the ship did after this, but presumably it was used in normal shipping. On 23 November 1933 the SS Liberty collided with SS Ohioan in the Ambrose Channel, the main shipping channel in and out of the Port of New York and New Jersey. The Ohioan was beached near the West Bank Light (there is footage on the web of the Ohioan ashore but you have to pay to see it). 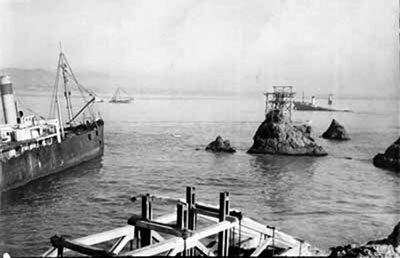 It seems that the Ohioan was later refloated and on 8 October 1936 it ran aground at Parallel Point (named after the Parallel which sank there in 1887) in San Francisco Harbour near the Golden Gate Bridge. In fact, there is a photograph of it aground and also in the photo is the SS Frank H Buck. The Frank H Buck collided in 1937 with the SS President Coolidge. The SS Liberty was now apparently owned by the US Maritime Commission (basically a new version of the US Shipping Board). In 1939 she was being used by the Southgate-Nelson Corporation of Norfolk, Virginia. They had a few shipping lines, but it is not clear which one was using her. They may have been using her since 1919. In 1940 the SS Liberty was taken over by the United States Army in the build up to World War 2. 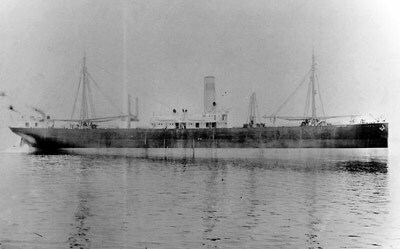 She was now called USAT Liberty (USAT = United States Army Transport). In May 1941 an agreement that the US Navy would take over larger Army ships was made. The USAT Liberty was given the US Navy designation AK-35. However, the Navy was not able to find sufficient crew to take her over so she remained an Army ship. USAT Liberty was assigned to the Pacific Ocean and at the time of the attack on Pearl Harbor, appears to have been on the way to Australia. 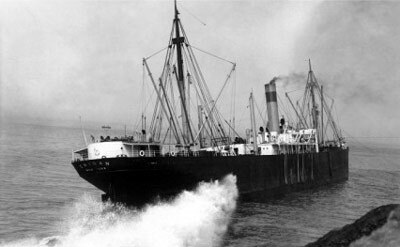 In early January 1942 the USAT Liberty left Australia with a load of railway parts and rubber bound for the Philippines. On 11 January 1942 she was travelling towards Lombok Strait, Dutch East Indies (now Indonesia). Lombok Strait is the waterway to the east of Bali, between that island and Lombok. The Imperial Japanese Navy submarine I-166 was on patrol in the area and she spotted the Liberty 19 kilometres south-west of the strait at S8º 54' E115º 28'E. At least one torpedo was fired (probably more) and a direct hit on the Liberty fatally wounded her. The Liberty was taken under tow by the destroyer USS Paul Jones and the Dutch destroyer Van Ghent. They attempted to tow the Liberty to the nearest port, Singaraja, which is on the northern side of Bali. However, the Liberty was too badly damaged and taken so much water that they beached her at Tulamben, also on the northern coastline of Bali. It would seem that the cargo and some fitting were salvaged as a result. The Liberty sat on the beach till 1963 when nearby Mount Agung erupted and the tremors caused the ship to slip back off the beach into the water. She now lies with her bow facing the north-west. Click here to read about the diving on USAT Liberty. Click here to return to the list of diving at Tulamben.